And WHY blindly implementing your upline’s formula for success (and taking their advice) is statistically likely to result in miserable and humiliating FAILURE. Luckily, according to one of my mentors Ferny… it doesn’t have to be this way! It’s positioned in such a way that it makes people believe that if you just listen to your upline, and follow the steps, you’ll have massive success as a result. Well, that’s not how it works…at all. Entrepreneurs or network marketers are not paid to work; they’re paid to get results. Okay, now how is this different from how most network marketing leaders train their people? …and have them implement their formula for success? It’s not really emphasized in any teaching. They’re too busy selling the dream! But sometimes they don’t even tell you to do that. Maybe they tell you what to do, but they don’t really tell you HOW to do it. But let’s say, for argument’s sake, that you’re being plugged into a system where you’re able to learn a few things. Then, after you learn, you’re supposed to put it into action, right? After you’re told to learn something, study this, plug into this system, go watch these videos, whatever—hopefully, you’re at least getting that. Most of the time, especially if you’re doing old school stuff, it’s going to be a brutal experience, dealing with a lot of negativity, and a lot of people who don’t support you. You’ll experience no recruits, no people to talk to, and you’ll quickly run out of your warm market. You take action and all of a sudden you’re out all this money after you invested in tools, travel, and other expenses. You take the action, you leave a message, you’re following the script and then no one responds. Here’s the thing: that’s normal. But that’s not what anyone told you about network marketing when you were getting started! Falling flat on your face is normal and it’s what you do afterwards that actually matters. They identify the people that were negative as losers, meaning their opinion doesn’t matter. Most of the time what happens is that, if you really want to succeed after you’ve been told this by your upline, you just pick yourself off the ground and you try again. You’re going to fall flat on your face, again! You’ll still experience the same result, or even worse results. That’s essentially what happens and it becomes too painful & pathetic at a certain point. So you see it’s possible that your upline’s advice is garbage and it’s their fault. Might bear some responsibility for your failure, and for not bringing you into the 21st century. 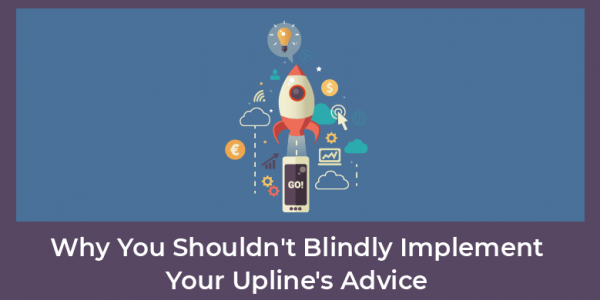 Blaming your upline doesn’t do you any good! In either case, it gets you nowhere. Let’s assume you are working with an upline who’s teaching you some strategies in the online space, like social media and attraction marketing. Yet you’re still falling flat on your face; you still keep failing and nothing is working. What’s happening here is that you’ve never been taught how to evaluate. Heck, you’re not even taught that you need to evaluate. That that’s where the process ends. Regardless of who your upline is, regardless of the advice or the feedback you’re getting, whether you’re learning attraction marketing, social media recruiting, or even if you’re doing things old school. Here’s the thing, though: evaluation doesn’t have any judgment. This is how you get closer to where you want to go, as opposed to getting frustrated and all negative and emotional, or negative about somebody else who you’re blaming for your lack of success, which gets you nowhere. Evaluation is the process that’s going to allow you to adjust every time you take action, so that your results are not a negative experience anymore. And by doing this, it guarantees you’re going to get closer to your goals or what you want to achieve, because you’re evaluating and you’re making adjustments. Again, one of those things that worked can be that you took action, or that you learned something about people, or people’s negative responses. If that’s your answer, then you’re in judgment—you’re being emotional and you’re not able to objectively look at what’s in front of you. When you take your emotions out of it and you’re able to evaluate, and you’re able to answer the question of what worked, then you’re going to be more effective, and you’re going to get closer to your goals. If you judge yourself and beat yourself or others up, then you’re going to get nowhere. Make a list of two things that didn’t work. Again, it’s not a blaming thing. Write two things that didn’t work. Don’t go crazy with what didn’t work. When you make that adjustment, now you’re doing something differently, based on the objective information you received. All you need to do is make a list of things that worked, that didn’t work, and what might you do differently. So we’re eating our own cooking here. When you’re evaluating, you’re able to move closer to where you want to go, because you’re able to make incremental changes based on the information you’re observing, and you’re consistently moving closer to the outcome you want. Granted, that’s not to say that what your upline is teaching you isn’t important. It absolutely is, and if you’re doing things old school and going through this evaluation process, it still might take you a very long time, until you eventually get to the point where you’re producing the desired result and having success. That’s how the process works and so the list of things you put down might be small, and they might be a little bigger. When you’re constantly evaluating, you’re virtually guaranteed success. You’re always going to be making adjustments that get you a little closer. If you’re goal’s right here and you’re over here, well, you can make adjustments. This doesn’t mean the next time you do something; you’re going to have a massive success as a result of using this evaluation process. But you’re going to get closer, and then you’re going to get closer, and then you’re going to get closer, until you finally achieve the result you want. And what might I do differently? Maybe you’re reading this and are brand new to Elite Marketing Pro. Or maybe you’re not there yet, but you realize it’s different than what you’re currently being taught. Or might you do something different that still moves you closer to your goals, but removes what’s not working for you in your life? Look, blindly following anybody’s advice and trusting it’s going to work for you, without evaluation and adjustments, is always going to lead to failure. It’s a video course where I’ll walk you through how to build your business using the latest technologies—where prospects come to you on a daily basis—already interested in what you’ve got!